I recently had the opportunity to visit a backyard egg producer. This person allowed me to take a tour of their small-scale, local, free-range, “humane” enclosure for their chickens. Had I not already known that this was a backyard egg-producer, I would have thought it resembled some of the nicest animal sanctuaries I have visited. The enclosure was a large amount of space for the number of chickens living there, it was well maintained, complete with thin, almost invisible wires above to keep the hawks from grabbing the chickens. If I was a chicken living there, I would probably think that I had a good life. The thing is, this wasn’t an animal sanctuary and these chickens were not viewed as individual beings with their own right to govern their own bodies — to be the autonomous creatures they were born to be. Instead, I was at a backyard egg producer. They even named the birds and had “favorites”, got to know each chickens distinct personality and behavior. All might seem peachy keen on the outside, but when you dig a little deeper, the truth becomes more and more apparent and increasingly impossible to ignore. I’ll start from the beginning of the chickens journey from the hatchery to the backyard egg producer’s home. Keep in mind, this is a typical example of the life of a backyard chicken and is in no way isolated to this one particular backyard egg producer. The chickens are purchased from a hatchery which is usually located out of state (in this case, from Illinois). A box containing eggs (however many the person orders) is sent to their address (in this case, California). A disclaimer is packed with the box which informs the customer (the backyard egg producer) that only half of the eggs will hatch because not all of the eggs will survive transport. So there is already half of the chickens, dead for no reason at all. Of those chickens who are fortunate or misfortunate (depending on how you look at it) to hatch, half of those chickens will be roosters (males). Because males don’t lay eggs, they are either discarded right away or they are allowed to grow large enough to be slaughtered and eaten. So only about 25% of those original eggs will be female, egg-producing hens. Chicken rescued from a backyard egg producer. Those hens are allowed to live a seemingly nice life where they are allowed to attend to their basic needs such as dust bathing, preening, pecking at the earth, and other chicken activities. They are permitted to do these things only until their production declines or stops completely. Many of these breeds of chicken have been bred for so many years and artificially selected to lay more and more eggs to such an extent that their reproductive system shuts down after a few short years and they become known as “internal layers”. This is just one of many medical issues hens get between 2-5 years of age, regardless of how “happy” a life they had in their early years. Keep in mind, when properly cared for even chickens with medical issues can live 15-20 years. But because this is a backyard egg producer we are talking about, a hen who won’t lay is a hole in their pocket. In the words of this particular egg producer, “They eat my food but don’t give me anything back so they have to go.” They said this meaning they have to be killed. How do they do this? An inverted traffic cone out back holds the chickens upside down with their head sticking out the bottom. The cone keeps their wings from flapping as they would naturally struggle to save themselves from death, as anyone would. Chickens aren’t interested in dying, and they aren’t stupid. They know what death and suffering is when it’s dealt to them. The egg producer “lovingly” bends the chickens neck back and slices it open with a sharp knife, letting the chicken slowly bleed to death. You can find youtube videos of “humane chicken slaughter” which show this method of slaughter frequently used by backyard butchers. You will see the chickens writhe in pain and frantically kick their legs. You will see them try to flap their wings in a vain attempt to escape. You will hear the guttural noises emanating from their throats as they try to cry out in agony. There is no such thing as humane slaughter. Even in places like these. So the cycle goes every couple years. Another box, more dead chickens in eggs, more dead roosters, and soon enough, more dead hens. All in the name of greed, gluttony, food addictions, willful ignorance, selfishness, and a complete disregard for the rights and feelings of each creature to own their own life and to be free from exploitation. Thankfully, they let me have three of their older chickens (just a few years old). Two hens and one rooster. The hens were no longer producing eggs and the rooster was getting “old” so they wanted to make room for the “new” ones. So instead of being turned into chicken soup, these chickens are able to live out the rest of their lives in a safe place. All three chickens have new homes. The two hens are living out their lives in an animal sanctuary with the resources to tend to their reproductive medical needs. The rooster is living with another vegan animal rights activist on two acres of land. He should have a flock of hens joining him (rescues) very soon. And to think these beautiful beings would have been someone’s meal. They are so much more than that. It’s easy to think of animals in an abstract sense, but they are not a number; they are individuals. If you aren’t already vegan, know that you have it in you to change if you want it badly enough. Align your actions with your beliefs. If you don’t believe you are a cruel person, but you are still participating in a system which is inherently cruel (even in the most “humane” places), ask yourself “Am I okay with being ethically inconsistent?” If actions speak louder than words, ask yourself, “What do my actions toward animals say about me as a person?” If you consider yourself a rational person and yet you find incongruence between your beliefs of compassion toward others and your actions of causing harm to others (by paying for someone to be killed), wouldn’t the logical and rational next step be to stop causing harm to others? All of the vegans in the world are living proof that this option is absolutely possible and I don’t know a single vegan who would deny someone help with transitioning to a vegan lifestyle. The world is changing. Can you keep up? More info on backyard eggs and “humane” meat. Typically it’s day-old chicks that are shipped live in the mail. You can order just pullets (girls), although sometimes there will be a rooster, or they add them to the box for padding. Most male chicks at hatcheries are killed. Chicks available at feed stores are from the same hatcheries. Very true. People gravitate toward willful ignorance. They prefer to remain in the dark. The fact that people say “I can’t watch that — I’m afraid I’ll go vegan” when asked whether they want to watch any animal rights documentary says it all. A common excuse I hear for why someone doesn’t want to accept information or literature about animal rights and veganism is “ignorance is bliss.” It’s such a shame. They know what the correct and ethical course of action is, but they fool themselves into believing that their willful ignorance absolves them of any guilt. The fact remains that whether they allow themselves to see it or not, it is still going on. Hi there. I’m trying to find out all I can about moving from vegetarian to vegan and I have a question no-one seems to be able to give me a clear answer on and I’m hoping you can help. What are your thoughts on having dogs, cats, rabbits, horses etc as ‘pets’ as surely they in no way lead a natural existence? Unless you live on a couple of hundred acres? What does that mean for us folks with furry family members in the city? Until there are no more animals dying in shelters, it is our responsibility to give them a home. Thank you Kara. This is interesting, important, very well-written, informative and accurate. I hope you keep this up and that many others emulate you. To think that humans, at such a high level of thought capacity, compared with many of the variable animal species of this particular planet Earth, are capable of having such vast respect, as to consider the often shorter lives of these other living creatures, as fully worthy to express the freedom of opportunity to live a completed life as far as their body takes them naturally without resistance. Thank you. You put together a lovely article here. I like your approach to educating. Thank you, Arlo. So glad you guys opened a location in Santa Monica! You hit the nail on the head. That’s EXACTLY the point that I try to drive home when people bring up “humane”, free-range animal products. It would not be okay, actually. This is slavery, they are only being valued as a product, because they lay eggs. “Humane” exploitation doesn’t exist. When you steal eggs from hens, regardless their condition, they suffer psychologicaly, they feel you are taking their babies away, and it is what it is being done. When they are bought, they are genetically modified to attend their exploiter’s needs, so they lay 300 eggs anually, instead of 17, which damages their cloaca (can you image yourself having a baby approx. each day?). When your friend takes their eggs, the hens have the wish of having afamily, which is always destroyed, so they also lay more and more eggs, trying to create families, and then, are destroyed. 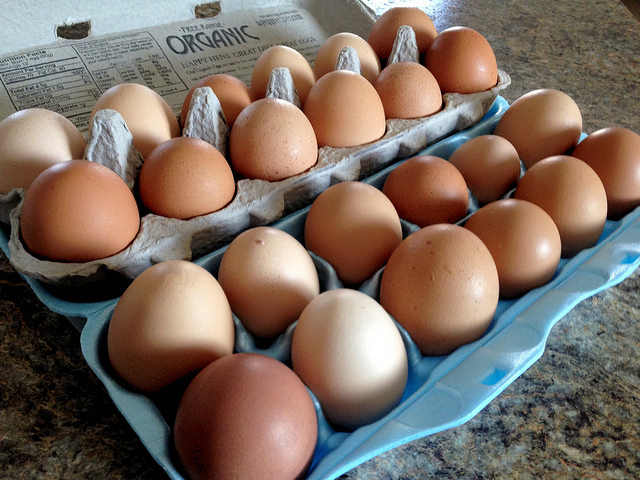 After laying unfertilized eggs, the hens loose a lot of calcium and nutrients, so they freak out, supposed to eat the egg’s shell… because eggs are stolen, they get calcium deficient. Remember: for every egg you eat, doesnt matter their condition, a hen is unable to form a family and is disnourished. They are not willing participants, and they are not here to serve anyone.